The BBC followed with an outrageous edition of Question Time, in which the audience shrieked abuse at anyone on the panel who uttered a word of sympathy for the US, and openly cheered the idea that the attacks were justified. Some of my New York friends were rung from London within days by people they had known for years to be told: "You know what everybody is saying here – that America got what it deserved." The tragic events of 9/11 were immediately followed by a grotesque and shameful fusillade of anti-Americanism, which still resonates today in the British establishment. Many Irish family members of the the Irish victims were deeply offended by the British abuse at the time .One Irishman John Anthony Hill after 151 days in a dark British Prison, most of it in solitary confinement, is now free. He was accused by the British of mailing of a “7/7 truther” DVD from Ireland to the United Kingdom.He was extradited from Ireland for sending a copy of the film, “Ripple Effect,” which outlines complicity by the British government in terror attacks that killed 56 of its own people in 2005, including 4 “suicide bombers” now believed to have been murdered in a bizarre plot. Many in Ireland believe, that the British secret services, organized a considerable part if not all of the 9/11 tragedy, while perhaps sub-contracting out minor roles to stooges.Ireland was Britain's first colony, it has 800 years of experience first hand, up close of their activities including their secret services using stooges, to bomb Dublin with 34 innocent victims.Their PR management is done by the British Broadcasting Corporation BBC world service. A scandal this year regarding one of its top agents revealed that the British secret services controlled BBC staff, with vetting and pedophilia blackmail along with the grooming most of Britain's politicians. The conflict in British occupied Ireland was needlessly intensified and prolonged by the "disastrous" activities of a core of army and secret services who colluded with dozens of murders according to Britain's top policeman including the murder of human rights lawyers, journalists and peace activists.The British state conspired to murder its own citizens according to their own top policeman.That is the credible conclusion that can be drawn from the evidence that has seeped slowly out over the past decade.Collusion between British forces and their state terrorists was the focus of hearings on Capitol Hill in Washington. One of the many benefits of the atrocity in New York was that the British were able to break the special Irish-American bond using the 9/11 narrative. The British Government started to use 'CMPs' based on the 9/11 narrative in order to enable secret trials conveniently reducing the potential to hold the Security Services accountable for malpractice in human rights abuses in which they are constantly implicated. Should you be subject to CMPs' process, you can expect that both you, your lawyer, and the public will be excluded from your court hearing. Secret ‘evidence’, usually based on security force intelligence data, is then presented against you, which you cannot challenge. A ‘Special Advocate’ is appointed to represent you but cannot discuss the secret ‘evidence’ with you. Presently two icons of Irish reisistance, prior to the 'peace process' to British occupation have been interned without trial for several years. Neither Marian Price or Martin Corey have any idea of what they are accused, charged or length of political internment. Both are completely innocent. and both being senior citizens will die interned without a proper trial. There is considerable supplementary evidence below and the Big Spirit willing, which we will return to in the future, to prove beyond reasonable doubt unlike their internment that the British Government are responsible for the 9/11 false flag operation. They have 800 year of experience in such activity, the organizational capacity with 'BBC Pedo Blackmail' within WASP ( White Anglo Saxon Protestant - Prescott Bush) The supposed Muslim hijackers have been found alive. There is no evidence to link the atrocity to the Muslim community and other than stooges possibly created by British SS, there is no evidence of Islamic involvement unlike the many lines of inquiry, which lead directly to the British Government and it pathological secret services who murder their own citizens, human rights lawyers and journalists who hold them to account, while politically interning without trial those who challenge their genocidal invasions of every country on the planet, with the exception of just ten countries. They British Government are responsible for a holocaust in Ireland, that exceeds the numbers disappeared by even Hitler! WHO ARE THE REAL TERRORISTS ?
) to keep it secret. The story has been censored from Americans and few know or remember the “British 9/11.” Fewer still are aware that a powerful legal case has been made showing full government complicity in the planning and execution of the attack and the extent the British government has gone to in order to suppress information about one of the worst kept secrets in history. The film “Ripple Effect,” considered a threat to British “security” led to one of the most incomprehensible criminal cases in recent years. Anthony John Hill "NOT GUILTY"
The 4 Muslim “suicide bombers” once believed responsible for the incident are now believed to have been recruited as part of a well documented mock terror drill scheduled for that day that included 1000 participants, some of them paid actors hired to carry dummy explosives. It’s the opinion of Sheffield University social-sciences professor Ridley-Duff, that Mr Hill’s Ripple Effect’snarrative of what happened on that day, is more plausible and better fits the facts than did the BBC’s 7/7 ‘Conspiracy Files‘ program. His well-referenced study focussed very much on what happened at Canary Wharf on that morning, seeing the Ripple narrative, whereby the young alleged bombers had been inveigled into a terror drill that morning, then fled to Canary wharf where they were shot – as the best account yet. The new 3rd edition of my book Terror on the Tube endorses this view. In contrast, the so-called ‘July 7th Truth Campaign’ hasscoffed at the Ripple narrative calling it ‘evidence-free conjecture,’ a quite breathtaking (and very revealing) remark. As part of what has been called “the continuing coverup of 7/7,” Britain reached across international borders and extradited a journalist, attempting to impose a 20 year sentence for an alleged infraction of British law that happened in another country. In doing so, Britain has claimed the right to censor any and all communication, print, video and internet in any country around the world that agrees support extradition under these circumstances. After 151 days in dismal Wandsworth Prison, much of it in solitary confinement, John Anthony Hill is finally free. The crime he was accused of was the mailing of a “7/7 truther” DVD from Ireland to the United Kingdom. Yes, you are hearing me right, he was extradited from Ireland for sending a copy of the film, “Ripple Effect,” which outlines complicity by the Blair government in terror attacks that killed 56 back in 2005, including 4 “suicide bombers” now believed by many to have been murdered in a bizarre plot. In a terror incident curiously time to support a political attack on the Blair government’s complicity in what has been increasingly characterized as an illegal attack on Iraq based on “sexed up” intelligence, now subject to one of the longest inquiries in British history, accusations have been made and strongly supported that place responsibility on British intelligence services aided by Israel. Sources high in the Bush administration tell us that the 7/7 attacks were staged to coincide with a push to attack Iran from Iraq while troop levels were high. Hundreds of millions of dollars were paid out to militia leaders and clerics in Iraq during what was called “the Sunni awakening” to temporarily end combat there to allow for staging of the Iran attack. More “false flag” attacks were planned, this time on American forces in the Persian Gulf, to coincide with “7/7″ but were prevented by commanders in the region. Since 2005, the groups funded by the American “payoffs” have reconstituted Saddam’s Baathist regime and have continued a reign of terror across Iraq that continues to this day. His documentary has been copied and handed out at mosques to thousands of Muslims in the UK. Most Muslims now believe ‘The Four’ to be innocent, largely because of ‘Dib’s work. The authorities were obviously determined he would not upset the 7/7 Inquest operation by getting his film into the hands of family members, press and God knows who else. This man scares them and has suffered accordingly. What Britain has done or has tried to do is beyond draconian. By the standards that Britain is calling “justice,” their reach has no end and their arrogance no limits. Nothing said, nothing written, nothing filmed, perhaps even nothing “thought’ is protected, any place on earth. If a case can be made to put Bush and Blair on trial for terrorist acts, Britain’s actions against Anthony John Hill makes that case. Posted by Gordon Duff on May 18 2011, With 7518 Reads, Filed under 9/11, Editor, WarZone. You can follow any responses to this entry through the RSS 2.0. Both comments and pings are currently closed. Gordon – very interesting (and suspicious) problem I’m having. I am a member of a British blog website. I am trying to share this link with my Brit friends there, and when I copy and paste the link, there are spaces that are automatically added to make the link disfunctional. When I try to edit out those spaces on the blog itself, the spaces aren’t shown. I had to explain to everyone on the blog what to delete to make the link functional. Are things that far gone already?! I’ve read Peter Power admitted in 2009 that the “trial” company was publishing group “Reed Elsevier”. If this is correct the links are scary. The Reed share of the publishing industry is Orwellian. (up there with Murdoch’s New’s Corp in their ability to control what we know about our world). Intrestingly enough Reed Elsevier purchased “Choicepoint” in 2008. Checkpoint is the company behind Jeb’s florida voting crime that got his brother Bush II elected. If you want to “write” global history as you go along what better organisation to ask than this? 7/7 is a mere citation for them. Ripple Effect is one history lesson I am giving my children. In July 1998, a former British MI5 officer, David Shayler, revealed that, in February 1996, British security services financed and supported a London-based Islamic terrorist group, in an attempted assassination against Libyan leader Muammar Qaddafi. The action, Shayler charged, in an interview with the British Daily Mail, was sanctioned by then-Foreign Secretary Malcolm Rifkind. On June 25, 1996, a bomb blew up the U.S. military barracks in Dharan, Saudi Arabia, killing 19 American soldiers. The next day, Saudi expatriate Mohammed al-Massari, the head of the London-based Committee for the Defense of Legitimate Rights, was interviewed on BBC. He warned the United States to expect more terror attacks, which he described as "intellectually justified..." Al-Massari is allied with the well-known Saudi expatriate Osama bin Laden, who, to this day, maintains a residence in the wealthy London suburb of Wembly. And London is the headquarters of bin Laden's Advise and Reform Commission, run by the London-based Khalid al-Fawwaz. Bin Laden has been given regular access to BBC and a variety of major British newspapers, to spread his calls for jihad against the United States. On Nov. 17, 1997, the Gamaa al-Islamiya (Islamic Group) carried out a massacre of tourists in Luxor, Egypt, in which 62 people were killed..Yet, the leaders of the organization have been provided with political asylum in Britain, and repeated efforts by the Egyptian government to have them extradited back to Egypt have met with stern rebuffs by Tory and Labour governments alike. On Dec. 14, 1997, British Ambassador to Egypt David Baltherwick was summoned by Egypt's Foreign Minister Amr Moussa and handed an official note, demanding that Britain "stop providing a safe haven to terrorists, and cooperate with Egypt to counter terrorism..."
For a while now London has been dubbed Londinstan because historically most of the mosques in Britain harbor jihadis who operated in the Balkans in the 1990s, and are now operating in this area. Volumes have been written about the British harboring of Islamic terrorists through its intelligence networks. The British have historically played havoc with Islamic groups. To begin with, the British created Pakistan, re-drew the maps in Arabia, and through the Sykes-Picot Treaty, became the controllers of most Islamic nations. Britain undermines Chinese sovereignty in Xinjiang, Russia sovereignty in Chechnya and Somali sovereignty, to name just a few. 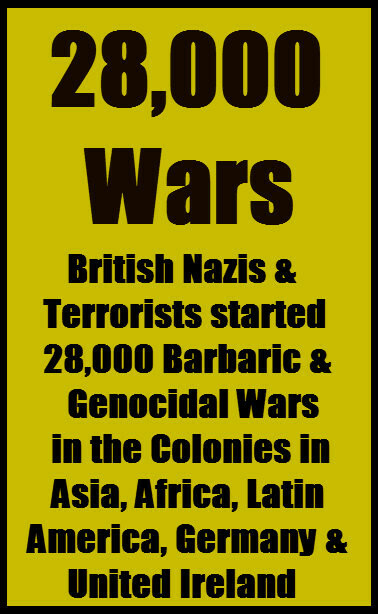 The reason for this harboring policy is that the core of British imperial method has always been to rule through orchestrating conflict and war, made possible by systematically organizing, funding, protecting, and deploying the most irrational and violent, opposing, sides, of each and every important conflict, anywhere in the world. For example, every opposing, insurgent group in Lord Palmerston's 1848-49 revolutions launched against Britain's rival Austrian Empire, was headquartered and deployed out of London. Operating from this same standpoint, Britain today, has fostered all important, and competing, terrorists groups in the Mideast. The essential feature of British imperial method: to blame its crimes on others, and rally its colonial victims, such as the Arabs, against the United States. Numerous terrorist groups are enjoying British hospitality. London's share of terrorist sects alone, according to security sources, is 1,400 which include 4,000 members who are active. Security sources describe these people, as 'the lords of terrorism of England.' They live a life of luxury, preying on the money donated by the millionaires and terrorist organizations, both in Britain and abroad, for their terrorist operations on behalf of British geopolitical aims. Terrorists recruited in England were to be found in Afghanistan, Kashmir, Chechnya, Bosnia, Macedonia, and Kosovo. Even French anti-terrorist experts talk about "Londonistan," and there is a connection between one of the worst Islamic terrorists from Britain with the London School of Economics, a center of anti-capitalist, anti-Western miseducation for almost a century. Egypt: British asylum for the Islamic Group and Islamic Jihad has been a persistent reason for Egyptian complaints to the British government. In April 1996, Egyptian Interior Minister Hasan al-Alfi told the British Arabic weekly Al-Wasat, "All terrorists come from London. They exist in other European countries, but they start from London..."
France: In late 1995, the GIA's London headquarters ordered a terror war against France, leading France to loudly protest to the British government, according to the Nov. 6, 1995 London Daily Telegraph, in an article entitled "Britain Harbours Paris Bomber." On Nov. 3, 1995, the French daily Le Figaro wrote, under the headline "The Providential Fog of London," of the GIA's bombing spree: "The trail of Boualem Bensaid, GIA leader in Paris, leads to Great Britain. The British capital has served as logistical and financial base for the terrorists..."
Algeria also filed strong protests to the British Foreign Office over the harboring of the GIA in London. Peru: The Peruvian government has made repeated requests to the British government, since 1992, demanding the extradition of Adolfo Héctor Olaechea, the London-based head of overseas operations for Shining Path, as well as the shutdown of its fundraising and support operations there. Both requests have been refused to this day. Turkey: On Aug. 20, 1996, the Turkish government formally protested to the British government for allowing the Kurdish Workers Party to continue its London-based MED TV broadcasts into Turkey, despite documentation that the broadcasts were being used to convey marching orders to PKK terrorists there. Germany: The Bonn government issued a diplomatic note to London, too, following a March 1996 MED TV broadcast in which PKK leader Apo Ocalan called for murdering German Chancellor Kohl and Foreign Minister Kinkel. According to the German press, the Interior Ministry stated concerning the London station: "We have requested our colleagues in neighboring countries in Europe to put measures into effect in order to not compromise internal security in our own country." Libya: On Feb. 7, 1997, the Libyan Foreign Ministry submitted an official protest to the British government, over Britain's permitting of the Militant Islamic Group to operate on British soil. Nigeria: On Feb. 28, 1997, the British government issued a denial that it had refused to extradite three Nigerians suspected of a series of bombings in the major city of Lagos in January 1997. The three men were leaders of the National Democratic Coalition (Nadeco). Yemen: In January 1999, the government of Yemen filed formal diplomatic protests with Britain for the harboring of the terrorists who carried out bombings and kidnappings. On Feb. 10, 1998, a group of well-known London-based "Islamists" and Islamic organizations issued a fatwa, calling for terrorist attacks against American targets. On Feb. 23, 1998, a second fatwa was issued, entitled "World Islamic Front's Statement Urging Jihad Against Jews and Crusaders." It called for killing Americans because of their "occupation of the holy Arab Peninsula and Jerusalem" and their "oppressing the Muslim nations," and concluded, "in compliance with God's order, we issue the following fatwa to all Muslims: The ruling to kill the Americans and their allies - civilian and military - is an individual duty for every Muslim who can do it in any country in which it is possible to do it. The two fatwas were the subject of testimony by an official of the Central Intelligence Agency on Feb. 23, 1998, before the Senate Subcommittee on Terrorism, chaired by Sen. John Kyl (R-Ariz.). At Senator Kyl's request, the CIA Counterterrorism Center provided the subcommittee with a declassified memorandum, titled "Fatwas or Religious Rulings by Militant Islamic Groups Against the United States." The memorandum stated that "a coalition of Islamic groups in London, and terrorist financier Osama bin Laden, have issued separate fatwas, or religious rulings, calling for attacks on U.S. persons and interests worldwide, and on those of U.S. allies..."
On Jan. 25, 1997, Tory Member of Parliament Nigel Waterson introduced legislation to ban foreign terrorists from operating on British soil. His "Conspiracy and Incitement Bill," according to his press release, would have for the first time banned British residents from plotting and conducting terrorist operations overseas...On Feb. 14, 1997, Labour MP George Galloway succeeded in blocking Waterson's bill from getting out of committee.